I tested a lot of games at PAX last weekend. Let's talk about Koi Pond Prototype C first. It was mostly well-received. People liked the fast, simultaneous gameplay, and it seemed couples liked the low-impact interaction that the predators provided. Everyone loved the "balance" scoring mechanic, too. But there was one comment that stuck with me. A playtester found it was "fundamentally uninteresting." By that he meant there is no necessary interaction or even a desire to interact. It's very much a head-down, multiplayer solitaire game. Furthermore, in the last two turns, you have too many cards in your hand to sort through, which also contributes to the head-down nature of the game. You're so focused on organizing your mountain of assets that you have even less reason to pay attention to anyone else. Now, I could justify this type of gameplay by simply pointing at the theme. Koi Pond tending is a different experience than in-your-face combat, after all. Those who are drawn to the theme may prefer that calm, quiet experience. Core hobby gamers are not necessarily going to be drawn to that kind of game (unless it's an app). But that's too easy. The process of game design requires constant refinement and reflection. In this case, I sense my own desire to send Koi Pond to production as soon as possible, to ride the wave of Belle of the Ball and Suspense's success from earlier this year. Seeing that in myself, I must pause for a moment to consider alternatives for Koi Pond that won't just make the game interactive, but make the players want to interact. If you've seen Prototype C, you've seen the Ribbons, Fishers and Dogs which I'm testing to add more in-the-moment interaction. However, I've got a potential revision to the overall flow of play that I tested at PAX that may solve several of these problems in one go. Hopefully this moves Koi Pond from its current position on the above graph (*) slightly up into the range of higher interaction, while keeping the same fun, fast, simultaneous gameplay (#). Instead of each player having her own river of discarded cards, there is a "lake" in the middle of the table. This is a loose pile of discarded cards shared communally with all players. The game is divided into Weeks and Days. A Day is divided into a Draw Phase, Placement Phase, Reveal Phase. Draw Phase: Each player takes turns drawing three cards, which may be chosen from the face-down draw deck or the face-up cards in the lake. Placement Phase: Each player places a card from their hand face-down into their pond and another card face-down into the lake. Any remaining cards stay in-hand. Reveal Phase: Each player reveals their chosen cards. 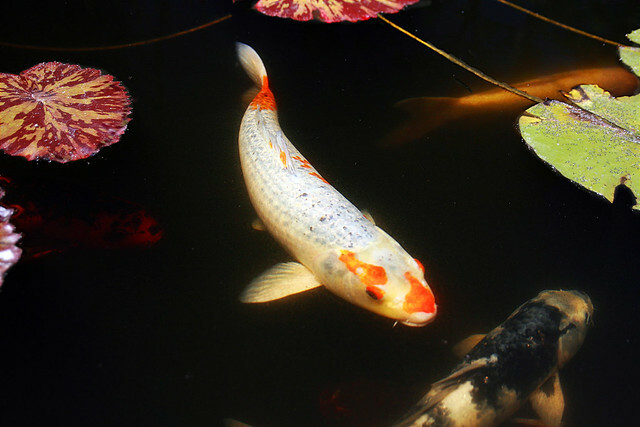 If you reveal a koi in your pond, you can place it in the appropriate stack. If you reveal a predator in your pond, you remove it from the game and choose one opponent as the predator's target. The opponent must remove any koi matching the predator's color from the game. Housecats remove matching koi from an opponent's house, Cranes remove matching koi from an opponent's pond, Turtles remove matching koi from the lake. Any player can protect pond, house or the lake by playing a Dog card. A Dog card used in this way is removed from the game. If you reveal a Fisher in your pond, you can draw two extra cards on your next turn. Having done so, you must remove that Fisher card from the game. A new Day begins after the last player reveals their choices. Each Week lasts FIVE days, at the end of which players score points and Ribbons are awarded as noted in Prototype C.
After three Weeks, the game ends and players earn bonus points for their ribbons. There is a lot to like in this variant. Players experience just a touch more interaction, along the lines of Lost Cities. Now you must worry about which cards you discard since your opponent can take them. Predators are much more straightforward, since they're simply action cards that have an immediate take-that effect. Furthermore, the deck doesn't run out nearly as fast, which means the deck can support up to five or six players, especially if dogs and fishers are included in the basic deck. The downside is that the game takes about twenty minutes longer, as you must wait for each player to choose their cards. This is slightly mitigated by the fact that once a player takes his cards, he can effectively proceed with the rest of his turn while everyone else makes their own choices. By the time the last player is taking their first phase, the first player is already done with their second phase. I'll continue testing this and other variants. I hate to make a simple, elegant game more complex than it needs to be, but I also hate leaving any stone unturned in a game's development. If Koi Pond ends up right back where it started as a low-interaction meditation game, I can at least say I tested the alternative.